People find it difficult to think about random variation. Our mind is more strongly geared towards recognizing patterns than randomness. 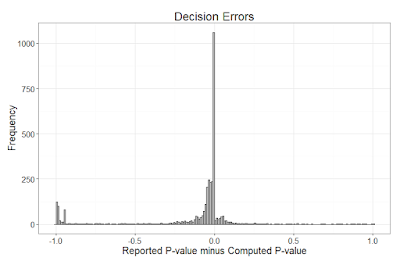 In this blogpost, you can learn what random variation looks like, how to reduce it by running well-powered studies, and how to meta-analyze multiple small studies. This is a long read, and most educational if you follow the assignments. You'll probably need about an hour. We'll use R, and the R script at the bottom of this post (or download it from GitHub). Run the first section (sections are differentiated by # # # #) to install the required packages and change some setting. 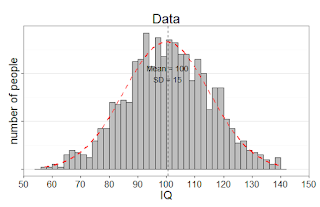 IQ tests have been designed such that the mean IQ of the entire population of adults is 100, with a standard deviation of 15. This will not be true for every sample we draw from the population. 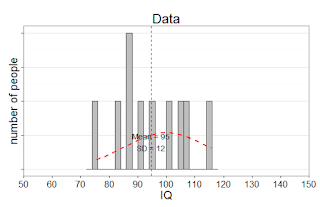 Let’s get a feel for what the IQ scores from a sample look like. Which IQ scores will people in our sample have? We will start by simulating a random sample of 10 individuals. Run the script in the section #Assignment 1. Both the mean, as the standard deviation, differ from the true mean in the population. Simulate some more samples of 10 individuals and look at the means and SD's. They differ quite a lot. This type of variation is perfectly normal in small samples of 10 participants. See below for one example of a simulated sample. Let’s simulate a larger sample, of 100 participants by changing the n=10 in line 23 of the R script to n = 100 (remember R code is case-sensitive). We are slowly seeing what is known as the normal distribution. This is the well known bell shaped curve that represents the distribution of many variables in scientific research (although some other types of distributions are quite common as well). The mean and standard deviation are much closer to the true mean and standard deviation, and this is true for most of the simulated samples. Simulate at least 10 samples with n = 10, and 10 samples with n = 100. Look at the means and standard deviations. Let’s simulate one really large sample, of 1000 people (run the code, changing n=10 to n=1000). The picture shows one example. Not every simulated study of 1000 people will yield the true mean and standard deviation, but this one did. And although the distribution is very close to a normal distribution, even with a 1000 people it is not perfect. In addition to planning for accuracy, you can plan for power. The power of a study is the probability of observing a statistically significant effect, given that there is a true effect to be found. It depends on the effect size, the sample size, and the alpha level. We can simulate experiments, and count how many statistically significant results are observed, to see how much power we have. For example, when we simulate 100.000 studies, and 50% of the studies reveal a p-value smaller than 0.05, this means the power of our study (given a specific effect size, sample size, and alpha-level) is 50%. We can use the code in the section of Assignment 2. Running this code will take a while. It will simulate 100000 experiments, where 10 participants are drawn from a normal distribution with the mean of 110, and a SD of 15. 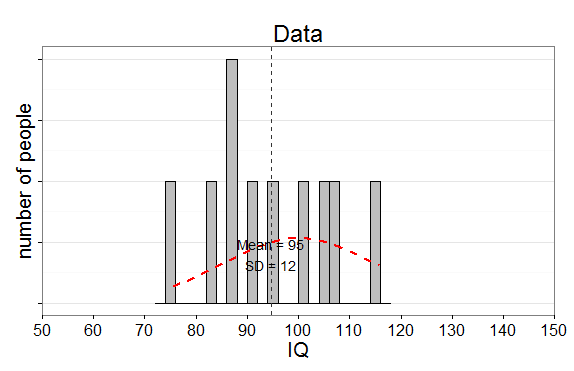 To continue our experiment, let’s assume the numbers represent measured IQ, which is 110 in our samples. For each simulated sample, we test whether the effect differs from an IQ of 100. In other words, we are testing whether our sample is smarter than average. The program returns all p-values, and it will return the power, which will be somewhere around 47%. It will also yield a plot of the p-values. 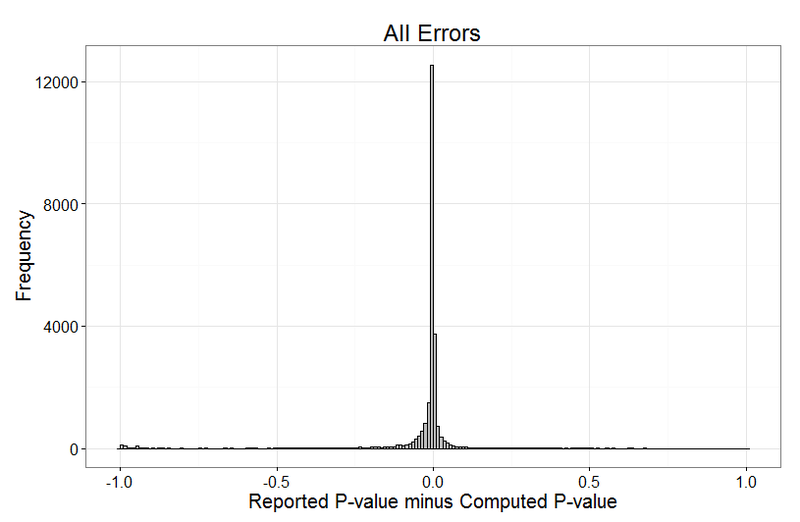 The first bar is the count of all p-values smaller than 0.05, so all statistically significant p-values. The percentage of p-values in this single bar visualizes the power of the study. Instead of simulating the power of the study, you can also perform power calculations in R (see the code at the end of assignment 2). To calculate the power of a study, we need the sample size (in our case, n = 10), the alpha level (in our case, 0.05), and the effect size, which for a one-sample t-test is Cohen’s d, which can be calculated as d = (X-μ)/σ, or (110-100)/15 = 0.6667. Using the simulation and the pwr package, examine what happens with the power of the experiments when the sample size is increased to 20. 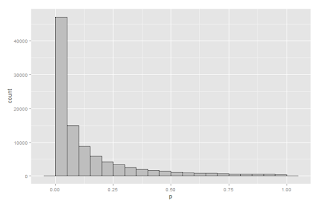 How does the p-value distribution change? Using the simulation and the pwr package, examine what happens with the power of the experiments when the mean in the sample changes from 110 to 105 (set the sample size to 10 again). How does the p-value distribution change? Using the simulation and the pwr package, examine what happens with the power of the experiments when the mean in the sample is set to 100 (set the sample size to 10 again). Now, there is no difference between the sample and the average IQ. How does the p-value distribution change? Can we formally speak of ‘power’ in this case? What is a better name in this specific situation? Variance in two groups, and their difference. Now, assume we have a new IQ training program that will increase peoples IQ score with 6 points. People in condition 1 are in the control condition – they do not get IQ training. People in condition 2 get IQ training. Let’s simulate 10 people in each group, assuming the IQ in the control condition is 100, and in the experimental group is 106 (the SD is still 15 in each group) by running the code for Assignment 3. The graph you get will look like a version of the one below. The means and SD for each sample drawn are provided in the graph (control condition on the left, experimental condition on the right). The two groups differ in how close they are to their true means, and as a consequence, the difference between groups varies as well. Note that this difference is the main variable in statistical analyses when comparing two groups. Run at least 10 more simulations to look at the data pattern. Compared to the one-sample case above, we now have 2 variable group means, and two variable standard deviations. If we perform a power analysis, how do you think this additional variability will influence the power of our test? In other words, for the exact same effect size (e.g., 0.6667), will the power of our study remain the same, will it increase, or will it decrease? In dependent samples, the mean in one sample correlates with the mean in the other sample. This reduced the amount of variability in the difference scores. If we perform a power analysis, how do you think this will influence the power of our test? Effect size calculations for dependent samples are influenced by the correlation between the means. If this correlation is 0.5, the effect size calculation for the dependent case and the independent case is identical. But the power for a dependent t-test will be identical to the power in a one-sample t-test. Up until know, we have talked about the variation of data points within a single study. It is clear that the larger the sample size, the more the observed difference (in the case of two means) or the more the observed correlation (in the case or two related variables) mirrors the true difference or correlation. We can calculate the variation in the effects we are interested in directly. Both correlations are mean differences are effect sizes. Because mean differences are difficult to compare across studies that use different types of measures to examine an effect, or different scales to measure differences on, whenever multiple effect sizes are compared researchers often use standardized effect sizes. In this example, we will focus on Cohen’s d, which provides the standardized mean difference. This formula shows that the variance of d depends only on the sample size and the value of d itself. Perhaps you remember that whenever the 95% confidence interval around an effect size estimate excludes zero, the effect is statistically significant. When you want to test whether effects sizes across a number of studies differ from 0, you have to perform what is known as a meta-analysis. In essence, you perform an analysis over analyses. You first analyze individual studies, and then analyze the set of effect sizes you calculated from each individual study. To perform a meta-analysis, all you need are the effect sizes and the sample size of each individual study. Let’s first begin with something you will hardly ever do in real life: a meta-analysis of a single study. This is a little silly, because a simple t-test of correlation will tell you the same thing – but that’s educational to see. We will simulate one study examining our IQ training program. 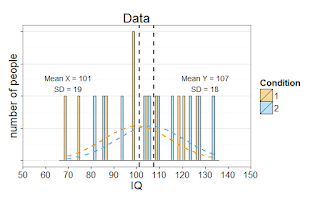 The IQ in the control condition has M = 100, SD = 15, and in the experimental condition the average IQ has improved to M = 106, SD = 15. We will randomly select the sample size, and draw between 20-50 participants in each condition. Our simulated results for a single simulation (see the code below) for the control condition gives M=97.03, and for the experimental condition gives M = 107.52. The difference (of the experimental condition – the control condition, so lower scores mean better performance in the experimental condition) is statistically significant, t(158) = 2.80, p = 0.007. 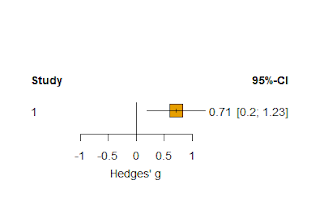 The effect size Hedges’ g = 0.71. This effect size overestimates the true effect size substantially. The true effect size is d = 0.4 – calculate this for yourself. Run the code in assignment 6 (I'm skipping some parts I do use in teaching - feel free to run that code to explore variation in correlations) to see the data. Remove the # in front of the set.seed line to get the same result as in this example. If we perform a meta-analysis, we get almost the same result - the calculations used by the meta package differ slightly (although it will often round to the same 2 digits after the decimal point), because it uses a different (Wald) type of tests and confidence interval – but that’s not something we need to worry about here. Run the simulation a number of times to see the variation in the results, and the similarity between the meta-analytic result and the t-test. The meta-analysis compares the meta-analytic effect size estimate (which in this example is based on a single study) to zero, and tests whether the difference from zero is statistically significant. We see the estimate effect size g = 0.7144, a 95% CI, and a z-score (2.7178), which is the test statistic for which a p-value can be calculated. The p-value of 0.0066 is very similar to that observed in the t-test. In this plot we see a number (1) for our single study. 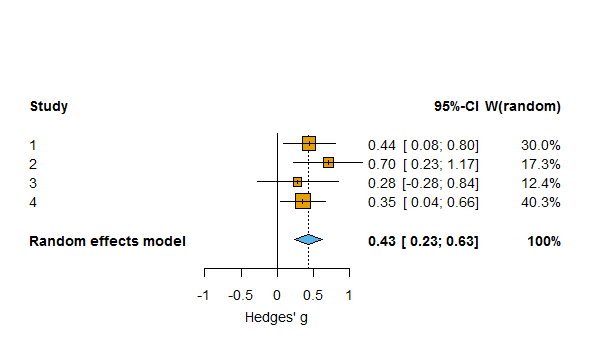 The effect size (0.71), which is Hedges's g, the unbiased estimate of Cohen's d, and the confidence interval [0.2; 1.23] are presented on the right. The effect size and confidence interval is also visualized. The effect size by the orange square (the larger the sample size, the bigger the square is) and the length of the line running through it is the 95% confidence interval. Meta-analyses are made to analyze more than one study. Let’s analyze 4 studies, with different effect sizes (0.44, 0.7, 0.28, 0.35) and sample sizes (60, 35, 23, 80 and 60, 36, 25, 80). Researchers have to choose between a fixed effect model or a random effects model when performing a meta-analysis. 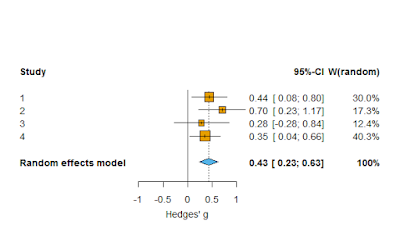 Fixed effect models assume a single true effect size underlies all the studies included in the meta-analysis. Fixed effect models are therefore only appropriate when all studies in the meta-analysis are practically identical (e.g., use the same manipulation) and when researchers do not want to generalize to different populations (Borenstein, Hedges, Higgins, & Rothstein, 2009). By contrast, random effects models allow the true effect size to vary from study to study (e.g., due to differences in the manipulations between studies). Note the difference between fixed effect and random effects (plural, meaning multiple effects). Random effects models therefore are appropriate when a wide range of different studies is examined and there is substantial variance between studies in the effect sizes. Since the assumption that all effect sizes are identical is implausible in most meta-analyses random effects meta-analyses are generally recommended (Borenstein et al., 2009). The meta-analysis in this assignment, where we have simulated studies based on exactly the same true effect size, and where we don’t want to generalize to different populations, is one of the rare examples where a fixed effect meta-analysis would be appropriate – but for educational purposes, I will only show the random effects model. When variation in effect sizes is small, both models will give the same results. In a meta-analysis, a weighted mean is computed. The reason studies are weighed when calculating the meta-analytic effect size is that larger studies are considered to be more accurate estimates of the true effect size (as we have seen above, this is true in general). Instead of simply averaging over an effect size estimate from a study with 20 people in each condition, and an effect size estimate from a study with 200 people in each condition, the larger study is weighed more strongly when calculating the meta-analytic effect size. R makes it relatively easy to perform a meta-analysis by using the meta or metafor package. Run the code related to Assignment 7. We get the following output, where we see four rows (one for each study), the effect sizes and 95% CI for each effect, and the %W (random), which is the relative weight for each study in a random effects meta-analysis. The line below the summary gives us the statistics for the random effects model. 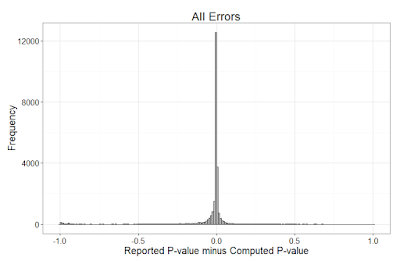 First, the meta-analytic effect size estimate (0.43) with the 95% CI [0.23; 0.63], and the associated z-score and p-value. Based on the set of studies we simulated here, we would conclude it looks like there is a true effect. The meta-analysis also provides statistics for heterogeneity. 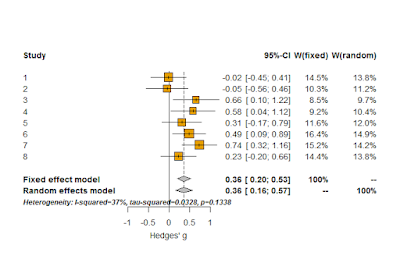 Tests for heterogeneity examine whether there is large enough variation in the effect sizes included in the meta-analysis to assume their might be important moderators of the effect. For example, assume studies examine how happy receiving money makes people. Half of the studies gave people around 10 euros, while the other half of the study gave people 100 euros. It would not be surprising to find both these manipulations increase happiness, but 100 euro does so more strongly that 10 euro. Many manipulations in psychological research differ similarly in their strength. If there is substantial heterogeneity, researchers should attempt to examine the underlying reason for this heterogeneity, for example by identifying subsets of studies, and then examining the effect in these subsets. In our example, there does not seem to be substantial heterogeneity (the test for heterogeneity, the Q-statistic, is not statistically significant). Play around with the effect sizes and sample sizes in the 4 studies in our small meta-analysis. What happens if you increase the sample sizes? What happens if you make the effect sizes more diverse? What happens when the effect sizes become smaller (e.g., all effect sizes vary a little bit around d = 0.2). Look at the individual studies. Look at the meta-analytic effect size. Instead of typing in specific number for every meta-analysis, we can also simulate a number of studies with a specific true effect size. This is quite informative, because it will show how much variability there is in small, underpowered, studies. Remember that many studies in psychology are small and underpowered. In this simulation, we will randomly draw data from a normal distribution for two groups. There is a real difference in means between the two groups. Like above, the IQ in the control condition has M = 100, SD = 15, and in the experimental condition the average IQ has improved to M = 106, SD = 15. We will simulate between 20 and 50 participants in each condition (and thus create a ‘literature’ that consists primarily of small studies). You can run the code we have used above (for a single meta-analysis) to simulate 8 studies, perform the meta-analysis, and create a forest plot. The code for Assignment 8 is the same as earlier, we just changed the nSims=1 to nSims=8. Pretend these would be the outcomes of studies you actually performed. Would you have continued to test your hypothesis in this line of research after study 1 and 2 showed no results? Simulate at least 10 small meta-analyses. Look at the pattern of the studies, and how much they vary. Look at the meta-analytic effect size estimate. Does it vary, or is it more reliable? What happens if you increase the sample size? For example, instead of choosing samples between 20 and 50 [SampleSize<-sample(20:50, 1)], choose samples between 100 and 150 [SampleSize<-sample(100:150, 1)]. Some people are skeptical about the usefulness of meta-analysis. It is important to realize what meta-analysis can and can’t do. Some researchers argue meta-analyses are garbage-in, garbage-out. If you calculate the meta-analytic effect size of a bunch of crappy studies, the meta-analytic effect size estimate will also be meaningless. It is true that a meta-analysis cannot turn bad data into a good effect size estimation. 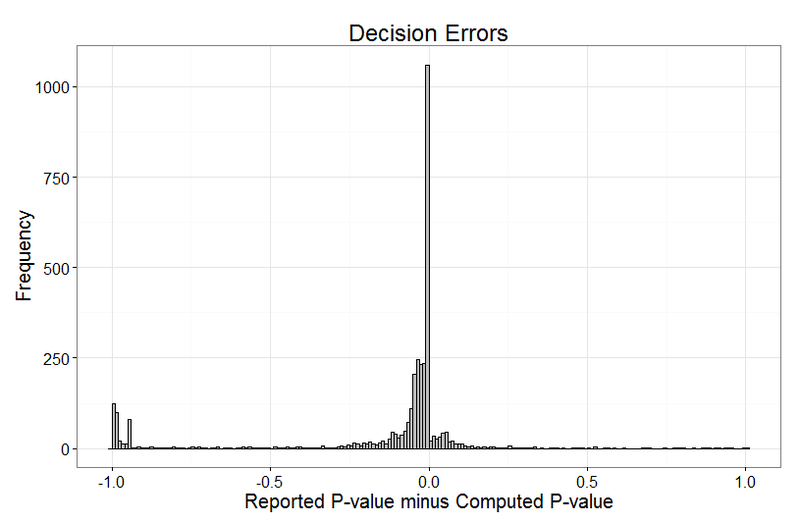 Similarly, meta-analytic techniques that aim to address publication bias (not discussed in this blog post) can never provide certainty about the unbiased effect size estimate. However, meta-analysis does more than just provide a meta-analytic effect size estimate that is statistically different from zero or not. It allows researchers to examine the presence of bias, and the presence of variability. These analyses might allow researchers to identify different subsets of studies, some stronger than others. Very often, a meta-analysis will provide good suggestions for future research, such as large scale tests of the most promising effect under investigation. Meta-analyses are not always performed with enough attention to detail (e.g., Lakens, Hilgard, & Staaks, 2015). It is important to realize that a meta-analysis has the potential to synthesize a large set of studies, but the extent to which a meta-analysis succesfully achieves this is open for discussion. For example, it is well-known that researchers on opposite sides of a debate (e.g., concerning the question whether aggressive video games do or do not lead to violence) can publish meta-analyses reaching opposite conclusions. This is obviously undesirable, but points towards the large degrees in freedom in choosing which articles to include in the meta-analysis, as well as other choices that are made throughout the meta-analysis. Nevertheless, meta-analyses can be very useful. First of all, small scale-meta-analyses can actually mitigate publication bias, by allowing researchers to publish individual studies that show statistically significant effect and studies that do not show statistically significant effect, while the overall meta-analytic effect size provides clear support for a hypothesis. Second, meta-analyses provide us with a best estimate (or a range of best estimate, given specific assumptions of bias) of the size of effects, or the variation in effect sizes depending on specific aspects of the performed studies, which can inspire future research. That’s a lot of information about variation in single studies, variation across studies, meta-analyzing studies, and performing power analyses to design studies that have a high probability of showing a true effect, if it’s there! I hopethis is helpful in designing studies and evaluating their results.